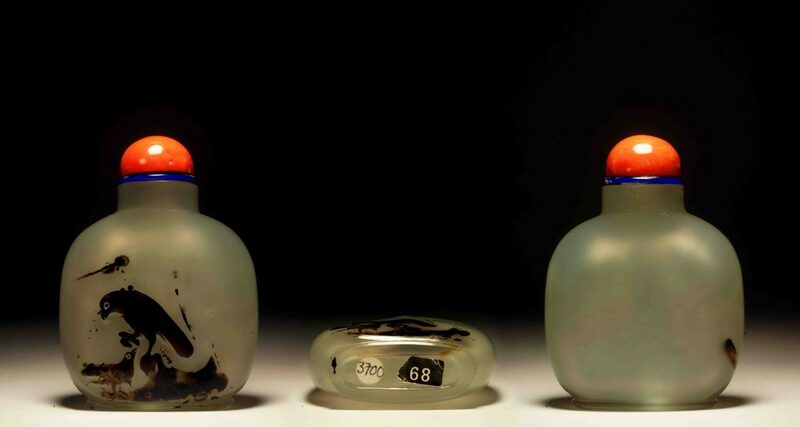 Well-hollowed, of rounded square form standing on a short oval foot ring, with a cylindrical neck, recessed lip, cleverly manipulating the dark inclusions in the gray-toned matrix, carved to one side with an intimate scene depicting a hawk perched on rocks looking down at a younger bird; the reverse left undecorated. 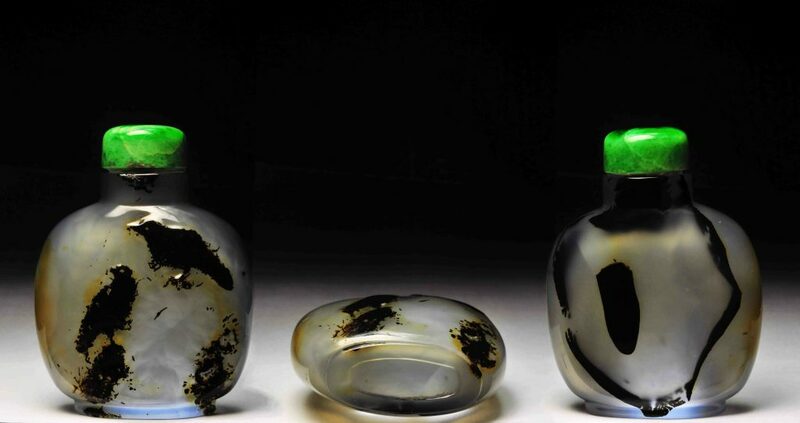 An agate snuff bottle, 19th century, Well hollowed, of flattened, rounded rectangular form, resting on a flat, oval foot, the stone of a pale translucent grey with dark brown inclusions carved in relief as a pair of perching birds below a tree flanked by the sun, scattered clouds and hovering birds, coral stopper carved as a curling Buddhist lion. A SILHOUETTE AGATE SNUFF BOTTLE, 1800-1880. 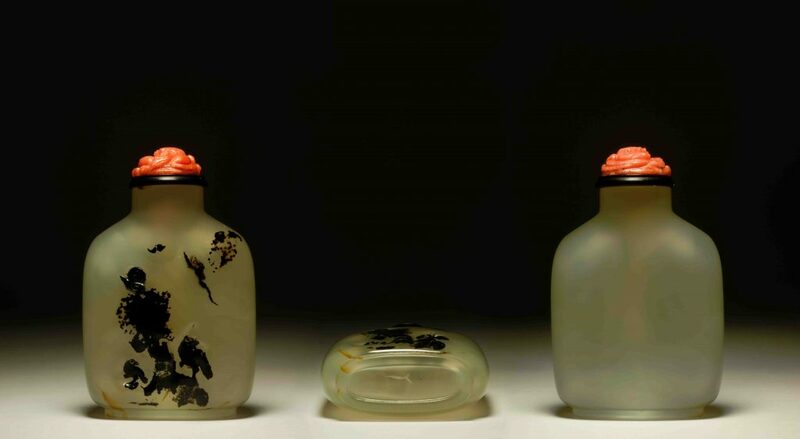 The pale greyish-white bottle is carved through dark russet markings with two confronting roosters. Ruth and Carl Barron Collection, Belmont, Massachusetts, no. 2779. Robert Kleiner, Belfont Company Ltd., Hong Kong, 1999. 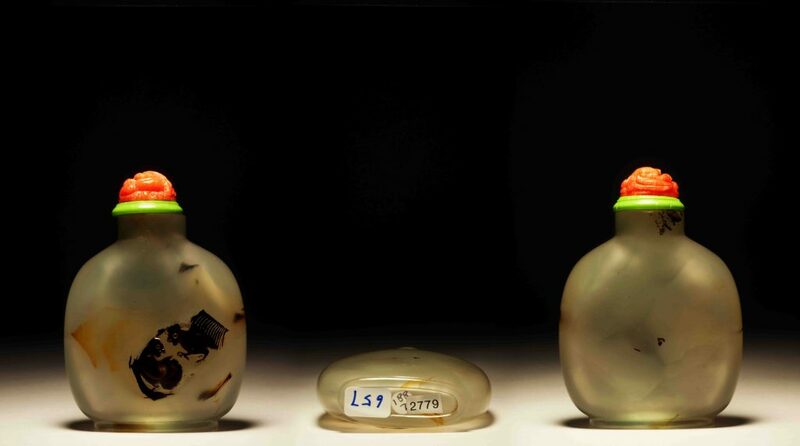 A shadow chalcedony 'bird' snuff bottle, 1780-1850, Well-hollowed, the flattened globular bottle raised on a spreading oval foot ring, with a straight neck, recessed lip, utilizing the natural dark inclusions in the semi-translucent gray stone, carved to the front to display two birds and rock formations, the reverse naturally forming an intriguing zen style image with an ink stroke-like dot within an irregular circle; uneven surfaces.